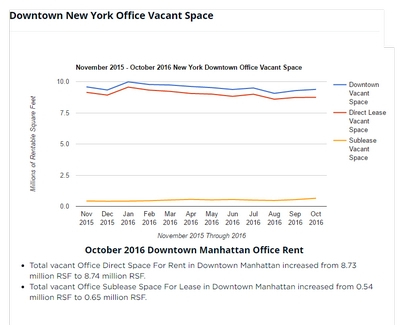 Available direct Manhattan office space declined in all 3 office markets. 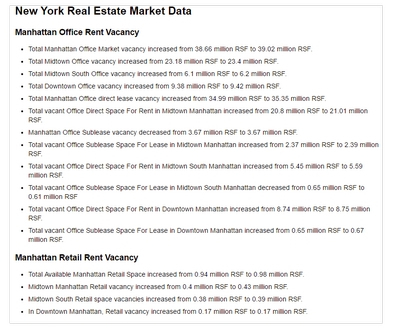 Subleases for Manhattan offices increased slightly in Midtown and Downtown. 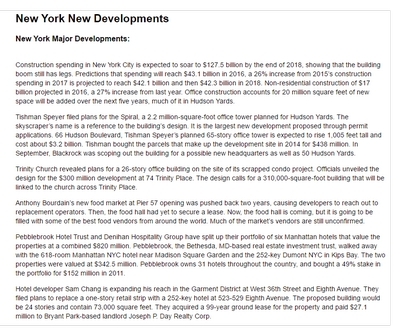 Available Manhattan Retail space that was listed was down last month. This seems counter intuitive given how many storefronts remain vacant. Two possible theories: 1. Landlords have pulled spaces off the market or 2. Prices have come down enough that leases are getting done. 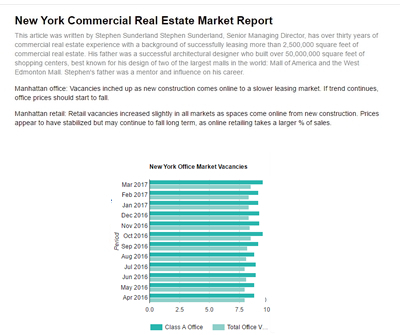 The first signs of distress have emerged in several areas of the New York City’s commercial real estate market in recent months. 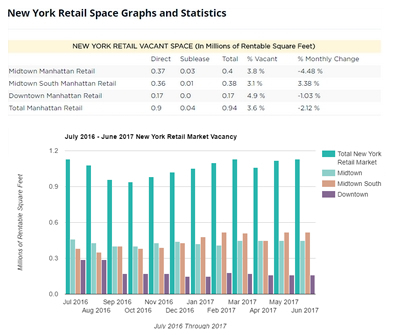 Retail vacancies increasing, declining hotel revenues and foreclosures on Park Avenue are among indications that the market is inching closer to financial trouble. 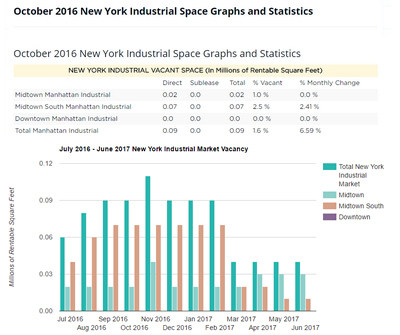 Leasing activity in Manhattan’s office market is the same as mid-2016, with less new supply coming online. Less supply means the absorption picture is looking better. 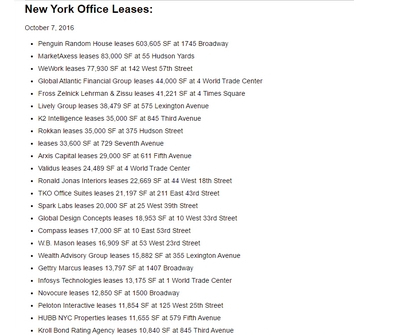 Leasing activity was down 21% year-over-year at 2.3 million square feet. 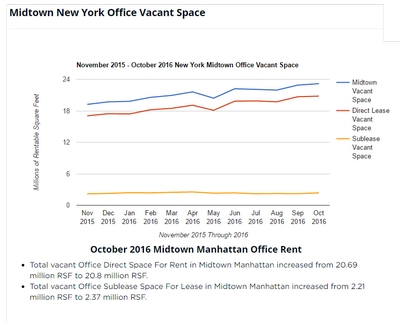 Midtown office leasing activity dipped to 920,000 square feet from just over one million square feet the month prior, and the availability rate increased slightly to 11.9% from 11.8%. 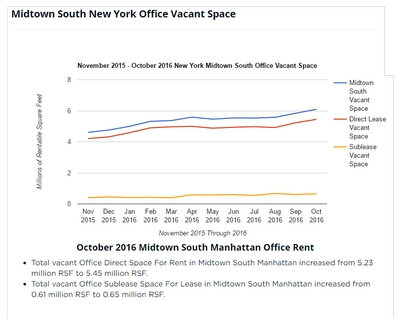 Leasing slumped in Midtown South, where there was 490,000 square feet of activity, down 29% from a year ago. 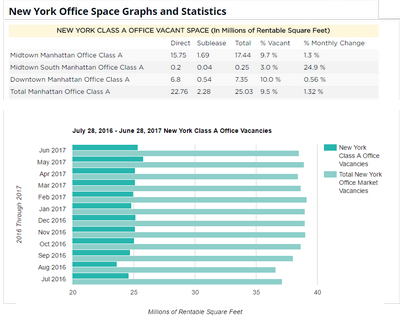 Downtown Manhattan, office leasing activity totaled 677,000 square feet, 56% above the five-year monthly average of 433,000 square feet. Downtown has more than 1.2 million square feet of available space, asking $50 per foot or less. 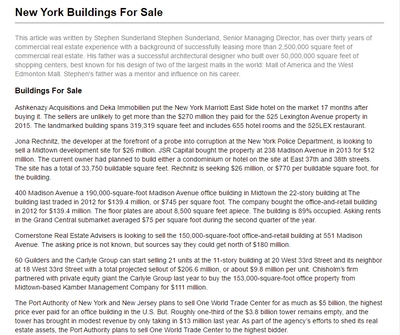 There is 4.2 million square feet available, asking between $51 and $60 per foot. TAMI tenants accounted for roughly 30% of leasing activity in the Downtown market. 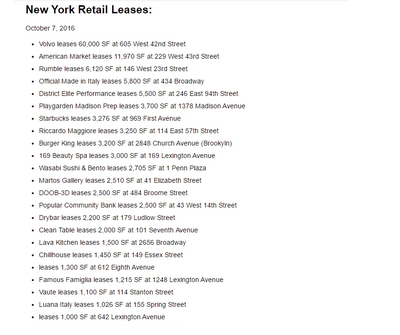 Nearly 200 storefronts on Broadway are sitting vacant. Almost 60% of the vacancies are below 110th street. 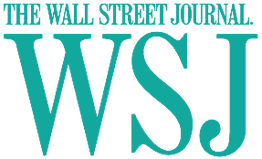 Apparel and other retailers are feeling the squeeze from online competition, grocers, food halls and restaurant tenants. The ten biggest retail leases totaled 156,532 square feet, and the five food-focused tenants accounted for 107,000 square feet, 70% of that figure. New store footprints are shrinking. The average lease size for the year was about 2,700 square feet, compared to 3,100 square feet in 2016. There was a 32% increase in new deals in the 2,500- to 10,000-square-foot range in 2016 from the previous year.